I buy juice and in the past, I have been tricked. Our family enjoys the taste comforts of cranberry juice and usually we buy it mixed with grape or apple. On occasion, I have been tricked into purchasing "cranberry juice cocktail" which is a portion of cranberry juice and a lot of high fructose corn syrup. 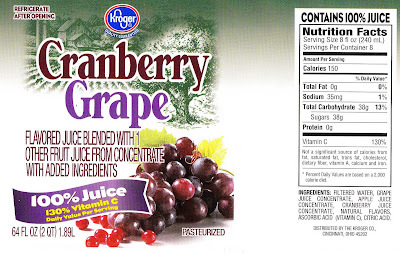 This week, I purchased the Kroger Brand Cranberry Grape containing 100% juice. Because the Cranberry came first in the name on the label, I assumed that it was the most popular juice in the bottle. Grape would obviously be in second. When I got home, I noticed the very lengthy description on the label. It seems that there is a BONUS "1 other fruit juice" blended in! What could this BONUS fruit be? It would have to be something tropical like Guava or maybe something exotic like Mangosteen!! And it would have to be a small portion of juice since the name of unsaid juice isn't on the label. Let's look at the Ingredients! Apple? Not only is apple the "other fruit" but it is also the second highest portion right after grape. The drink should be called Grape Apple Cranberry Juice. I felt like complaining to Kroger for their trickery, but then I took another look at the label and realized that the poor apple, the food staple from our youth that came in both box and foil bag, has been down graded to "other" status. Kroger's whip smart marketing team believes that if you put the word "apple" on the label, people will not buy the juice because they believe it is a second class juice! This is an outrage! The apple has stood by us year after year and its deeds should be recognized, not shunned to "other" status. Apple should be written in BOLD letters on the label! We should highlight it and add bright flashing lights around this word Apple that Kroger fears. Let us hold up apple to the status it deserves! And this way, when I am trying to buy just Grape Cranberry juice, I will know to avoid the one with the large bold letters and flashing lights.